Provide comfort for the family of Henry Goodell with a meaningful gesture of sympathy. Henry A. Goodell, age 84 of Rose Manor, PittsfIeld, died Sunday, February 24, 2019 at Hillcrest Commons. He was born on June 6, 1934 in Washington, MA, the son of the late Claude A. and Helen Tulenko Goodell, Sr. 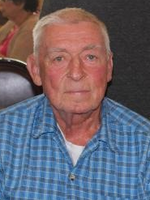 He was educated in Pittsfield schools and was a 1954 graduate of Pittsfield High School. He served in the United States Air Force from 1954 until 1957. Mr. Goodell worked as an appliance repairman for various businesses and retired as a refrigeration technician from Hillcrest Hospital. He enjoyed fishing, travelling, spending time outdoors; but mostly enjoyed making people laugh. Henry Goodell is survived by his two daughters: Lori A. Goodell of Pittsfield, and Lisa M. (and Robert) Gasteyer of Wilbraham, MA; two sisters: Marjorie E. Marusarz of Pittsfield, and Joan Lackey of Niantic, CT; three grandchildren: Ella Stodden, Ryan Gasteyer, and Kara Gasteyer; his former wife: Elizabeth Mancari Goodell; many nieces and nephews including Gary Marusarz who he was very close to. He was pre-deceased by his brother Claude A. “Biggie” Goodell, Jr., who died on May 9, 2006. FUNERAL NOTICE: Funeral services will be private and at the convenience of the family. In lieu of flowers, donations may be made to Berkshire County Kids Place or Elder Services Meals on Wheels Program, in care of DERY FUNERAL HOME, 54 Bradford Street, Pittsfield, MA 01201. To send flowers in memory of Henry A Goodell, please visit our Heartfelt Sympathies Store.